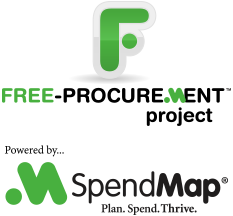 We’ve had a few requests from the Free-Procurement community for the ability to enter a “Request for Reimbursement” in SpendMap. This has already been added to the system and is coming in the 2014 release of SpendMap. Also known as “expense management” and “expense reports”, this includes the ability for staff to request reimbursement for something that they purchased and paid for personally, instead of creating a Requisition or Purchase Order in the procurement system. What role do expense reimbursements play in your Purchasing process? Some would argue that it should be avoided and that expense reimbursement is not ideal from a Spend Management perspective, since the approval process comes after the purchase transaction (in a perfect world, all spending would be approved before the products or services are ordered). But in some cases it’s just not practical to create a Purchase Order for everything that you buy. Common examples include things like travel expenses, meals and entertainment, and so on. In any event, while we always advocate for pre-purchase spend control whenever possible, we understand that expense reimbursements play an important role in some Purchasing environments, and we have already added Expense Reimbursement functionality to SpendMap, allowing users to submit expense reimbursement requests, which can be routed for online approval based on user-definable business rules, just like Purchase Requisitions. Once approved, SpendMap will send a “check request” to your Accounting System to process payment to the employee, update the status of the cost center’s budgets, and so on, all without the hassle, errors and delays that are inherent with paper-based expense reports. These new features will be available in the 2014 release of the Free Version of SpendMap.